If you're wondering how to engage your kids this Children's Day, then here's your answer. Cubbon Park is having a one of a kind carnival called Makkala Habba, which means festival of kids. It is being hosted by the Department of Women and Child and the government of Karnataka. This carnival hosts an array of fun activities, games and events in which both parents and children can take part. 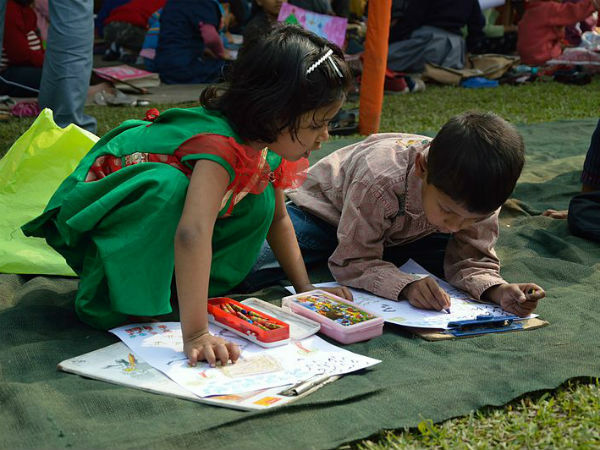 These activities include clay modelling, rural sports, face painting along with exhibitions, such as skits, flower show, etc. The carnival began on the 11th of November and will be ending today, 14th of November. It lasts from 9 am to 6 pm. Head to Cubbon Park this Children's Day and relive your childhood days while spending quality time with your kids. Cubbon Park was created during the British Raj, back in 1870, and has expanded since. It is home to a wide variety of flora and is spread with lush greenery and thickets of trees that offer a refreshing escape in the middle of the city. The landscaping was done such that this greenery was coupled with rock outcrops, enormous bamboos and flowerbeds that are now looked after by the Horticulture Department of the State Government. The roads surrounding the park remain closed only between 5 am to 8 am to favour the morning walkers and joggers. Cubbon Park is home to 96 species of flora that account for about 6000 plants and trees. Some of the ornamental and exotic trees you can witness here include silver oaks, gulmohar tree, to name a few. Since Cubbon Park is one of the oldest and most beloved parks of the city, various activities take place here regularly. Apart from jogging, walking, you can see people performing yoga that is undertaken by many different groups or institutions. It is also a quick and easily accessible haven for photographers, where you can see amateur video-makers creating their magic. Innumerable events, such as skits, poetry, etc., take place on the weekends. You can also bring your pet dog since Cubbon Park turns into a dog park every Sundays, where many pet owners bring their dogs and let them mingle with the rest. Bangalore Aquarium or the Government Aquarium, which is sometimes commonly known as Cubbon Park Aquarium, is located at the entrance of the park. It is India's second largest aquarium that was built in 1983. This octagonal building is home to 14 huge tanks on the first floor and two rows of 69 tanks in the second floor. You can see many species of fish, such as angelfish, eels, mahseer, red-tailed shark, moontail, etc. The aquarium remains open from 10 am to 5.30 pm on all days of the week. It stays closed on Tuesdays of the second week. Attara Kacheri is an ancient two-storeyed building that was constructed in 1864 AD, at the time of British rule. It was built as public offices but it is now the Karnataka High Court. The construction was in the style of gothic architecture and is located at the entrance of the park; the red hue of the building gives the place an outstanding look. A memorial hall was built in honour of Sir Seshadri Iyer, the former Dewan of Mysore State between 1883 to 1901. It is a brilliant red building that was constructed in a European style of architecture and has columns of Tuscan and Corinthian order. It is now a library that comprises of about 2.65 lakh odd books.